Silverlight 2 supports managed code. When Silverlight 2 runtime is installed, it installs a limited version of .NET runtime on the client machine. This allows .NET programmers to write managed code to be executed on the client PC and provide a better user experience to the users. Of course, there is security and restrictions built in to it so that the code has limited access to the client computer. Developers must be aware that if the end user decline to install the .NET runtime on their client computer, the Silverlight 2 applications will not run. Silverlight and Windows Presentation Foundation (WPF) are 2 different products from Microsoft, but has lot of overlap. Silverlight is a sub set of WPF in terms of features and functionality. Silverlight is a Microsoft technology, competing with Adobes Flash and is meant for developing rich browser based internet applications. WPF is a Microsoft technology meant for developing enhanced graphics applications for desktop platform. In addition, WPF applications can be hosted on web browsers which offers rich graphics features for web applications. Web Browser Appliactions (WBA) developed on WPF technology uses XAML to host user interface for browser applications. XAML stands for eXtended Application Markup Language which is a new declarative programming model from Microsoft. XAML files are hosted as descrete files in the Web server, but are downloaded to the browsers and converted to user interface by the .NET runtime in the client browsers. 1. Microsoft Expression Studio - this tool is meant for web designers to create rich visual elements for Silverlight applications. Expression Studio is recommended for web designers who create rich internet applications with enhanced visual content and graphics. There are several features provided for creating enhanced graphics elements with lot of options to pick color, font etc. 2. Microsoft Visual Studio - this is the integrated development environment from Microsoft to develop .NET applications. Programmers can use Visual Studio to develop Silverlight applications which require programming. Visual Studio allows programmers to develop sophisticated Silverlight applications in any .NET language (like C#, VB.NET etc). Which tool to use - Expression Studio or Visual Studio ? If your Silverlight application include just graphics adn visual elements, then you can use Expression Studio. However, if you are a programmer and if your Silverlight application include programming logic, then you might want to choose Visual Studio. 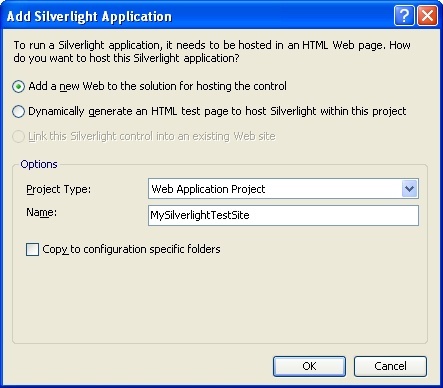 Silverlight Runtime is a plug-in for browsers to support Silverlight enabled applications. If Silverlight runtime is not installed, browsers will not be able to run Silverlight elements in the browser. You can set up your Silverlight tags such a way that your browser will automatically prompt the user to download and install the Silverlight plug in when your application is launched in the browser. Installing the run time is a one time operation on the client. Once installed, it will be automatically launched when any Silverlight application is loaded in the browser. Silverlight SDK is a set of tools, documentation, samples and templates for the web developers to help them easily develop Silverlight enabled applications. The SDK is not really mandatory to develop Silverlight applications, however, SDK will make development much easier. When the above xaml is executed, it will display a rectangle filled with red color. You may notice is that XAML is very similar to HTML in nature. What is .xap file ? .xap file is the compressed output file for the Silverlight application. The .xap file includes AppManifest.xaml, compiled output assembly of the Silverlight project (.dll) and any other resource files referred by the Silverlight application. Web pages like .aspx files and .html files use the Silverlight components by loading the .xap files using the <object> tag in the HTML or by using <asp:Silverlight> tag in the ASP.NET pages. ".xap" files (pronounced "zap") use the standard .zip compression algorithm to minimize client download size. A "hello world" .NET Silverlight application (built using VB or C#) is about 5KB in size. Let us see how a .xap file look like. 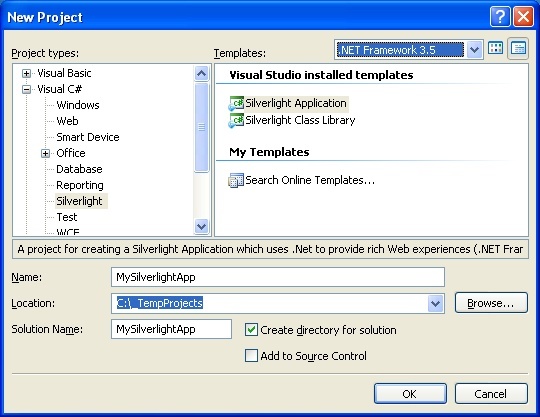 Open Visual Studio and create a new project by selecting "Silverlight Application" under the project type "Silverlight". Choose the project name "SilverlightTest". In the next screen, choose the option "automatically generate a test page to host Silverlight at build time". Compile and run the application by pressing Ctrl + F5. You can see the browser opening with an empty page (the page is empty because you have nothing in your default xaml file). Now open your windows explorer and look in to the bin\debug folder of your project. You can see a file called "SilverlightTest.xap". Rename this file to SilverlightTest.zip and open it using any decompression tool. You can see that this is just like any other zip file and it includes the projects output dll and another file called "AppManifest.xaml". Open Visual Studio and select the menu "File" > "New" > "Project"
Select the Project Type as "Silverlight" under your favorite language and choose the template "Silverlight Application". I have selected Visual C# as the tutorials here. I have named my project as "MySilverlightApp" and have selected the option "Create directory for solution" so that all my project files are organized within a folder structure. We need a web page to host the Silverlight components that we develop. Visual Studio makes this job easier in the next step by prompting you to automatically create a website. Choose the options as shown in the attachment. You are ready to rock ! Just press OK and Visual Studio will create 2 projects and a bunch of files for you. We will analyze some of the files created by Visual Studio in the next chapter. We will analyse some of the files. This file defines the assemblies that are deployed to the client applications. It is time to build and run your first Silverlight application. Press Ctrl+F5 to build and run your application. If everything is setup correctly, then Internet Explorer will be launched automatically with your default page which hosts your Silverlight object. Since you have not done much for your control, you will see a blank page opened in the browser. The second line defines the Silverlight control to be hosted in the web page. The attribute "Source" defines the .xap file to be used by the web page. This .xap file contains the XAML and code from your .xaml files and will be executed by the Silverlight plugin. In the current sample, you have just one xaml file called Page.xaml. When you compile the solution, this file is compiled into a special file (MySilverlightApp.xap) with the extension .xap. When Visual Studio creates the app.xaml file automatically, it creates few event handlers with some default code. You can change the code appropriately. For ASP.NET developers, the above code will look familiar. This is similar to the aplication level event handlers in Global.asax. The above code shows a user control and a Grid control. The UserControl is a high level control that holds all other UI elements in a xaml file. The Grid control is used as a layout panel and it can hold other UI elements. All UI elements in a .xaml control must be placed within a layout panel. There 3 different types of layout panels available in Silverlight 2.0. You will learn more about layout controls in a later chapter. When you compile your Silverlight Application project, it will compile all .xaml files and various other resources in to a single assembly file. This assembly file will have the extension .xap and will have the same file name as your project name. To place your Silverlight control in a web page, you must refer to this .xap file in your web page. When the .xap file is referred in a web page, the default .xaml page will be shown. Based on user actions, you may open or close various .xaml files included in your .xap assembly (Silverlight Application project). Let us add a xaml tag to your Page.xaml file and see how it works. Now compile and run the application. You can see a blue rectangle displayed in your web page. As demonstrated above, the elements in a Silverlight xaml page are declared using XAML tags. Silverlight 2 offers several XAML tags including common form tags like textbox, button etc and various other UI elements like rectangle. You can swap the position of the code and preview by pressing the icon with 2 arrows in the middle of the screen (between the tabs "XAML" and "Design". Also, you can use the icons on the right end between the code and design panes to change the position of the code pane and design preview. How to place a Silverlight control in a web page ? 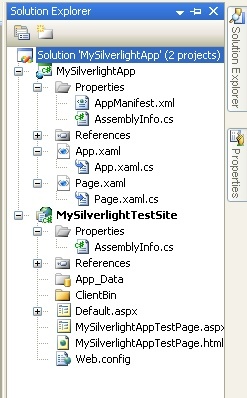 Each Silverlight Application project can have multiple .xaml pages. When you create a new Silverlight Application project, Visual Studio creates a default .xaml file called Page1.xaml. To add more .xaml pages, right click on the project in the Solution Explorer and select "Add" and "New Item". Then select "Silverlight User Control"
In the above tag, the attribute "source" represents the name of the xap file which is the compiled output of the Silverlight project. The .xap files contains the compiled version of all .xaml files included in the Silverlight Application project. Each Silverlight project can have multiple .xaml files. Each .xaml file is like a page or form by itself. When you place a Silverlight Application in a web page, only one .xaml control will be visible at a time. Based on various user actions, you may dynamically open various .xaml pages (Just like you open forms in a windows application). How to set default .xaml page in a Silverlight control ? Each Silverlight project can have multiple .xaml files. However, only one .xaml file will be visible at a time. When you create a Silverlight project in Visual Studio, it will create a .xaml file called "Page1.xaml" by default and this .xaml control will be displayed by default when you open the web page. You can change the default .xaml page by setting the property "Application.RootVisual". To try this, add a .xaml file called "Page2.xaml" in your silverlight project. After you change the value here, compile the application and run. When the web page is opened, you can see that the new .xaml control is displayed in the web page. How to open XAML pages from another XAML page ? You can change the above line to the class name of any oher xaml file to open that file by default. Another scenario is, you may want to open different xaml files from the default xaml page. For example, consider that you have a xaml control that prompt user to enter login information. After the login credentials are validated, you may want to redirect to another xaml file when the user click the "Submit" button. This can be done by setting the "Content" property of the xaml page. The above code shows how to set the "Content" property of the xaml control in the button click event handler. When the user click on the submit button, the new xaml file (NewXamlpage) will be opened and original xaml file will be recycled. There may be cases where you want different XAML files to be displayed when you refer to the same .xap file from different web pages. You can do this by passing the xaml file name or some other kind of identification using InitParameters property of the Silverlight control. This property can be set to the Silverlight control from the web page. The value set from web page will be read by the Silverlight control and appropriate xaml page will be opened. Here we are setting the property "InitParameters" with a key-value pair indicating which xaml page we want to open by default.